On November 16th, 2016, a utility excavator accidentally struck a gas line, allowing gas to escape into the historic Opera House in Canton, IL, eventually igniting and leveling the building. 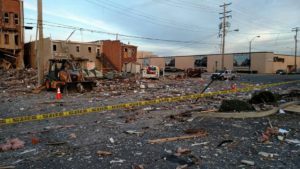 The explosion killed one utility worker and injured nearly a dozen people, including a one-call locator who was close by. It also caused damage to almost 100 surrounding small businesses, all owned and operated by local Canton residents. With windows blown out, so much infrastructure damage and crumbling foundations in most of the buildings in the square, one might wonder how a small community like Canton would endure and rebuild after such a disaster. Planet Underground TV first covered this incident in a previous issue of American Locator magazine (Vol. 31-1 Feb.2017, p.30), but wanted to revisit the aftermath of the explosion nearly 6 months later and document how it affected people’s lives. We travelled to Canton to witness firsthand the rebuilding and resurrection of this small town. Read more about the rebuilding of Canton in the June issue of American Locator. Subscribe today! Next Next post: American Locator – Global Damage Prevention – Out Now!